World literature: what’s in a name? What is world literature, and why are (some) people saying such bad things about it? You might think world literature would be easy to define. You might think it should refer to all the literature in the world, past and present. And you might think that the study of world literature — which goes back to the 19th century but has really taken off only in the 21st, with a rapidly growing and impressive body of work — should simply be the analysis of all the literature in the world, past and present. Yet many specialists in the area are uncomfortable with this approach. After all, we already have a name for all the literature in the world, past and present. That name is: literature. Why coin a new term? One answer is that we’re all, or nearly all, myopic. When we think of literature, we imagine something as circumscribed as our favorite subset of contemporary fiction, written in our own language and often in our own country. Even scholars with broad historical sweep routinely concentrate on a single language or, at most, on literatures in adjacent languages. So there’s something to be said for finding a designation suitable to a broader inquiry. Still, there’s world literature, and then there’s world literature. This distinction may be understood both structurally and historically. Structurally, we can contrast soft with hard definitions — all the literature in the world versus only that literature involved in global connections. Historically, it’s possible to track a not-quite-linear increase in such planet-wide interactions up to the contemporary connected scene. Hence, where some scholars adopt a then-to-now perspective on the topic, others limit world literature to the period beginning with Columbus, or the Industrial Revolution, or even the post-World War Two era. One might argue, however, that this disagreement doesn’t much matter, as long as we recognize cross-cultural ties of great antiquity as well as the qualitative expansion of such linkages in recent centuries and, above all, in recent decades. These debates concern definitional precision. But there’s also an objection to the very project of world literature. It has to do with what critics see as the parallels between world literature and globalization. The worry driving these objections is that attention to world literature amounts to de facto acceptance of globalization, together with all its injustices. The major intellectual predecessor to the field of world literature is colonial and post-colonial studies. Still thriving today, that line of inquiry turns on the continuing mistreatment of the poor nations by the rich. Attention to world literature might seem to repudiate this concern, instead positing a level playing field on which all peoples freely interact. Yet the world has changed. Along with increased hierarchy within countries, we find reduced — if still profound — inequality between rich and poor countries, together with a dramatic reduction in extreme poverty across the globe. There ought, then, to be no incompatibility between the two emphases indicated by post-colonialism and world literature. Both are important elements of the contemporary scene. So much for “world.” What about “literature”? Two points are worth noting here. Discussions of world literature are centered in the English-speaking world, and especially the United States. College and university literature departments there have increasingly broadened their disciplinary purview, with the result that many are now effectively programs in cultural studies. Ironically, then, the opening out implied by world literature coincides with an older emphasis on literature as traditionally understood. Second, that same US location of world literature means that it is situated in a country with an unusually high indifference to the literature of other nations and, even more, an ignorance of other languages. In this sense, the turn to world literature represents a salutary antidote to monoculturalism and monolingualism. No moral or political guarantees come with a literary curiosity about the experiences of people who display a striking combination of differences from, and similarities to, oneself. But it certainly beats the alternative. 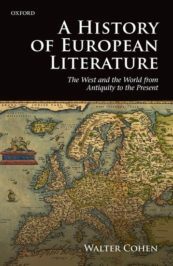 Walter Cohen is the author of A History of European Literature: The West and the World from Antiquity to the Present. For 34 years, he taught comparative literature at Cornell University, where he also served in various administrative positions. He is currently professor of English at the University of Michigan.